There were only a handful of places in my Hong Kong itinerary: The Peak, CTMA and Sino Centres, Citygate Outlet and Tim Ho Wan. 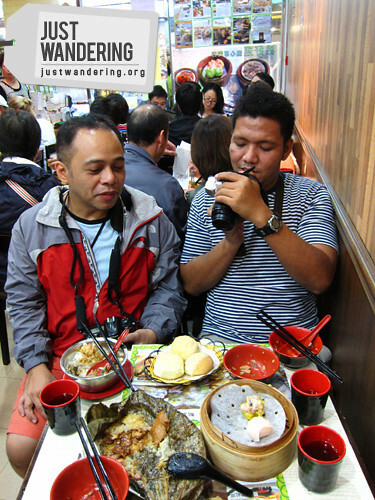 Luckily, I was with two happy foodies, Ferdz and Oggie, who were more than willing to try out this famed dim sum place. Tim Ho Wan is one of those hole in the wall dimsum place that is so small, it can only accommodate about 25 – 30 diners at the same time. Think Dong Bei, only a little bigger. It has no ambiance to speak off — walls are pretty bare, servers buzzing about in the small space, dumping baskets of dimsum unceremoniously unto each table. Drinks aren’t even served, apart from the usual tea found in all Chinese restaurant. You can bring your own drink though. So what makes this place special? It’s one of Hong Kong’s many Michelin Star restaurants. Owned by Pui Gor, former chef of Lung King Heen, a 3-star restaurant at the Four Seasons Hotel. Unlike other Michelin Star restaurants that charges an arm and a leg (and for some, your unborn children) for a meal, Tim Ho Wan caters to the casual diner. 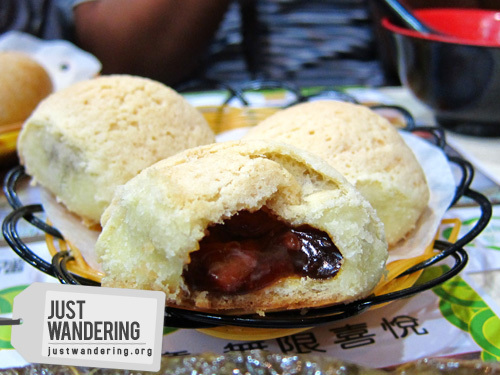 Tucked in a quiet neighborhood near Yau Ma Tei and Mongkok, the dim sum place is out of the way of any itinerary. It is, however, easy to spot: it’s the place where there’s always a huddle of people waiting outside. We arrived just after 2pm, we were told the wait would take 1 hour, due to the size of the restaurant and each dish are made to order. They had a queuing system: the receptionist would give you a sheet of paper and write down your number. This sheet of paper would also serve as your order form. There are two versions — ask for the English form so you can start figuring out what to order. It was around 4pm when our number was called. You can opt to wait it out, outside the restaurant or walk around and check out the nearby shops. Don’t worry if you find out they’ve already called your number when you come back — they will put you in a separate queue so you can enter as soon as a group go out. We were famished and ticked off a lot of boxes in our form. Everything was good, but there were some that really stood out. The steamed pork dumpling with shrimp a.k.a. siomai was bursting with flavor. It was unlike any other siomai we’ve ever tried. The glutinous rice dumpling sated our rice cravings. Warm gooey rice envelop flavorful chicken stew that makes you think it’s a Chinese-style adobo. The star of the meal though, was the restaurant’s baked bun with BBQ pork or crispy char siu bao. Think siopao made with a different kind of bread, topped with a mix of pork lard and sugar, then baked to crispy goodness. One bite, and we forget all about the long queue. Dim sum and noodles cost between HK$10 – HK$18; quite reasonable by Hong Kong standards. Considering the quality of the food you’re getting, an average of HK$40 – HK$60 per meal is a steal. This entry is one of a four-part Hong Kong Series. Read part 1 here. For more pictures, head on over to my flickr. Laking tuwa ko na sobrang sarap nga. Di ako napahiya! Try going early, but I hear there’s already a line even at 10am. But it’s really worth the queue! 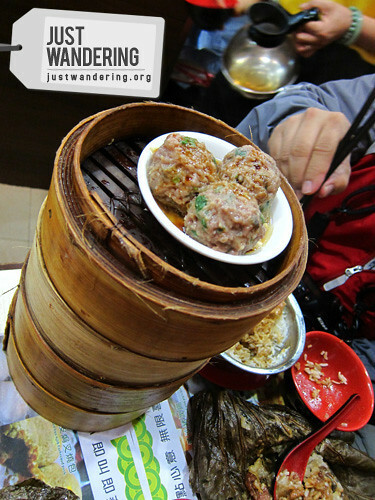 It was a mistake to check out this post… now I’m craving for dimsum! Grrr. And that crispy char siu bao looks divine. Argh! reminds me of this small Chinese noodle restaurant we just tried at China town yesterday, now I’m craving again for dimsum! Meep! Now I think a trip to Binondo is in order! food trip! this is what i missed during our stay in HK. sayang that we weren’t as adventurous with our taste buds. Sayang! Daming cheap eats actually. I’m so excited to go back! Happy new year din Ed! It was a lucky find indeed! This is a great piece of information. I’m wondering if you were able to check their operating hours? I’m planning to be there as early as 6 AM! LOL. Thanks, Nina! You’re doing a great job. panget ng website na 2!@! I’ll be visiting HK for the 3rd time this Wednesday and am keen on trying something new, will definitely look for this dimsum place! Thanks for sharing Nina! Mahaba lang ang pila at matagal ang antayan, but I tell you, it’s worth it! Do they accept reservation? Grabe ang waiting time nyo ah, 2 hours!